I love the fair. The humid night, the bright lights, the smell of fried twinkies and turkey legs drifting in the air. I say this now because there was a time when I forgot how much I loved the fair. 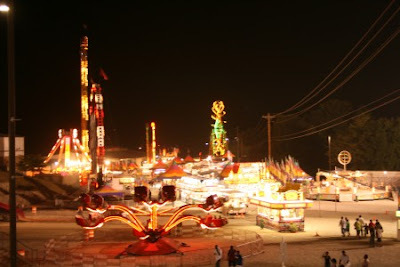 I got a little high-falutin' as they say and thought I was too sophisticated to walk amongst the Carnies. But then out of the blue my sister called to see if we wanted to join them in the land of sugar and sweat. Glee was coming on, which usually halts all plans in my world, but I thought it would be a nice change. 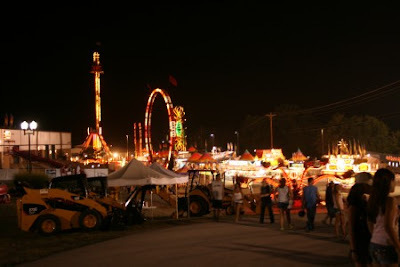 And so I packed up Rinks in his neat plaid shorts and loafers (I know, hindsight is 20/20) and we were off to the fair. I will admit, I walked in with somewhat of an attitude. Things were dirty, it was hot, and if that lady asked to guess my weight one more time I was going to punch her in the throat. But then I saw the tilt-a-whirl and like the waves cascading onto the shore, all the memories of my youth came flooding back and I threw Rinks at Ashley and literally bolted for the line. Losing all dignity I pushed two 8 year olds out of the way that were trying to take my buggie and then jumped in right in time to start spinning. After one taste it was on like donkey kong (oh yes I did) as I ran from ride to ride, handing my tickets to the nice gentleman with three teeth in his whole head and smelled oddly of cigarettes and ranch dressing. When I saw the Alpine coaster (who, by the way still has "Daisy Dukes" on replay from 1995) I had the urge to make Ashley ride it with me so we could make out with the teenagers. He denied me. By the end of the night Rinks was stripped down to his diaper with lemonade running down his belly and dirt up to his ankles (he fit right in) as Ashley pulled me off the Round Up. I wasn't ready to leave, and so I pouted the whole way home... but only with the left side of my body because the right side was still numb from The Sizzler.